I wanted to ask, does anyone know where a list of all of the existing ones might be at? If there isn't a list anywhere already, I've been thinking about making a list of all the ones that I know about. I'm a nice guy... I swear. 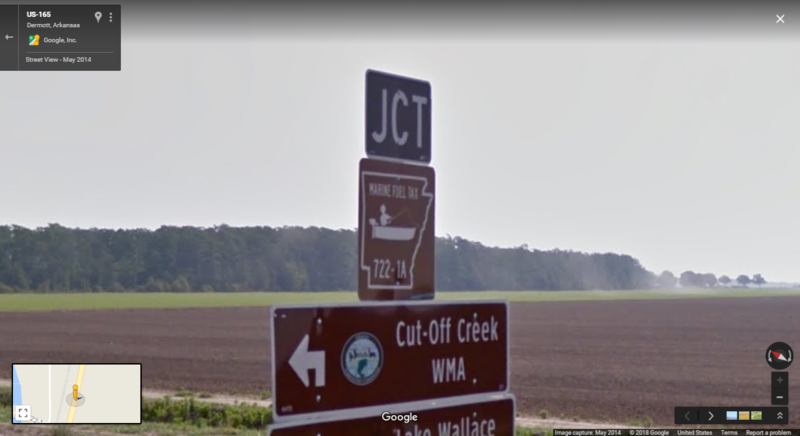 There is a MFT road with no number in Calion going to a Ouachita River access. Hmmm... that must have been updated some time ago since the last time I checked that list. ^^ Yes that is the sign I am referring to. I'm currently doing some research and I'm going to add to this list. Stay tuned. 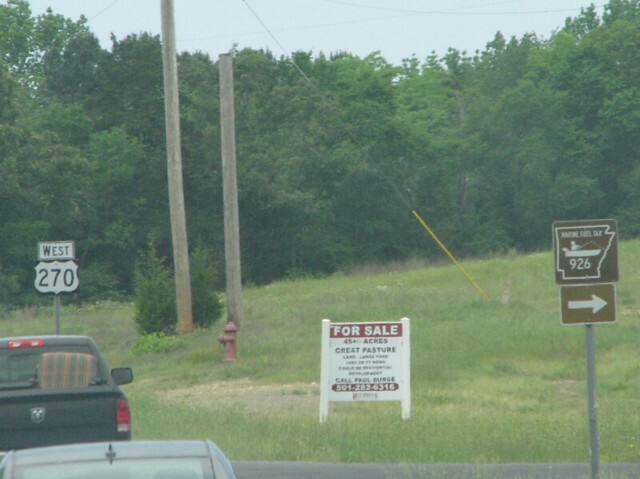 AR 819 - Joe Hogan Fish Hatchery road near Lonoke. 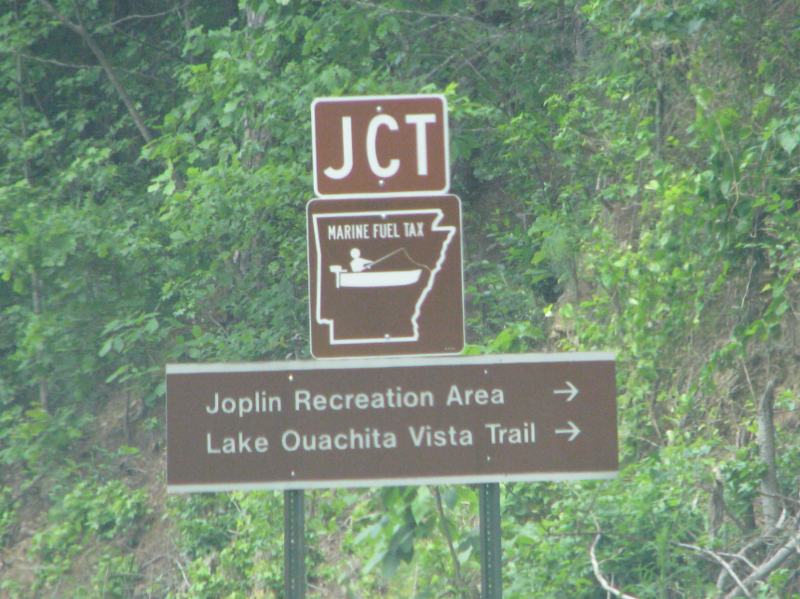 It is also known as Game and Fish Access Route 943. AR 980 - This one is the one everybody knows about, and they are usually fully signed. There are literally dozens of instances of Airport 980 all over the state. 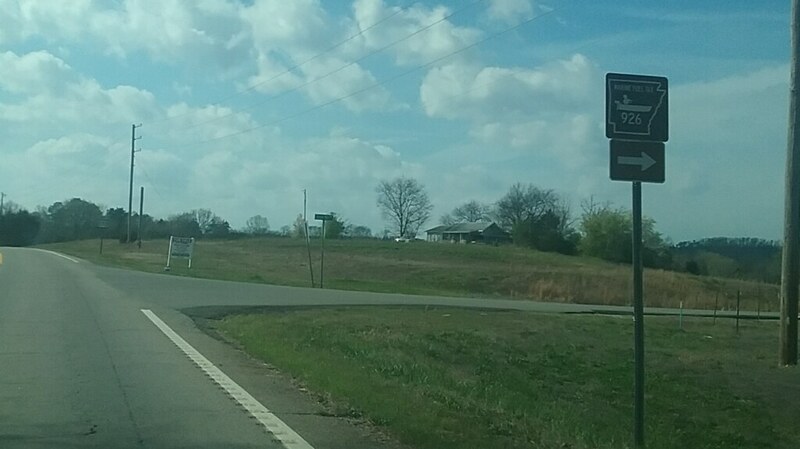 Arkansas' first 5-digit state highway. Nice! I can't remember where it was, but I took this picture of this sign 15 or 20 years ago. There is no number in the sign. It may be AR 949, Section 1 east of Mount Ida, but I can't remember for sure. I took that picture sometime around 1999-2000 IIRC. I'm 99% sure this was AR 949, Section 1 which is labeled as Twin Creek Road on Google Maps. I have searched every resource that I have been able to find and I haven't found a reference for AR 949, Section 1. I assume that it is the road that Google Maps has labeled as "Twin Creek Rd". This road is signed with the shield I posted above (or at least it was the last time I was through there, which has been several years ago. 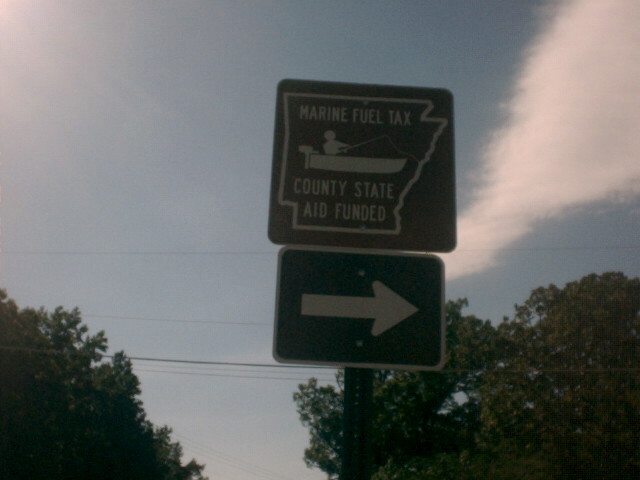 AR Marine Fuel Tax Highway 949, Sections 2, 3 and 4 are signed, and at one time AR Marine Fuel Tax Highway 926 (marked as Brady Mountain Rd and AR 926 by Google) was signed, although the signs were very faded the last time I was there, which was probably 15 years ago. 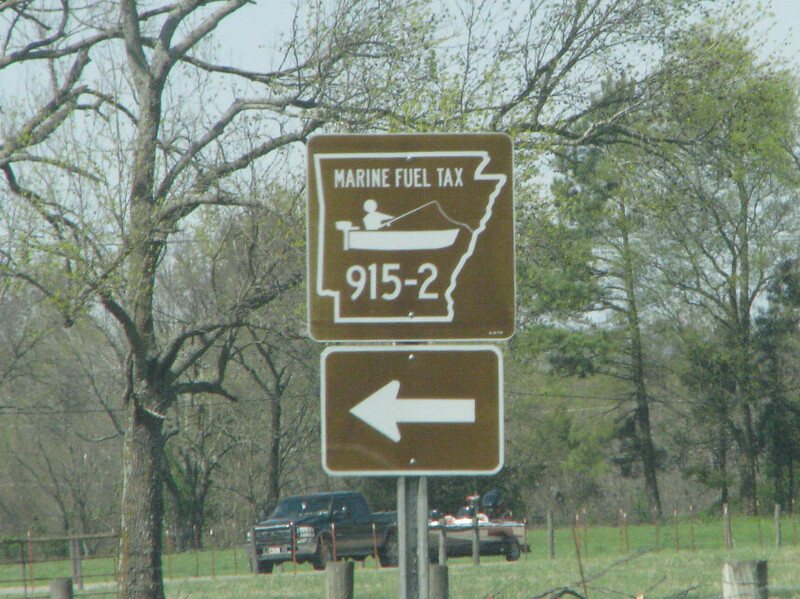 There are other signed Marine Fuel Tax highways in Arkansas but I believe these are the only five I have ever seen. Update: Apparently this is what AR 949-4 looks like now. What's with the non-MUTCD compliant font and arrows? MUTCD noncompliance is common in parks. 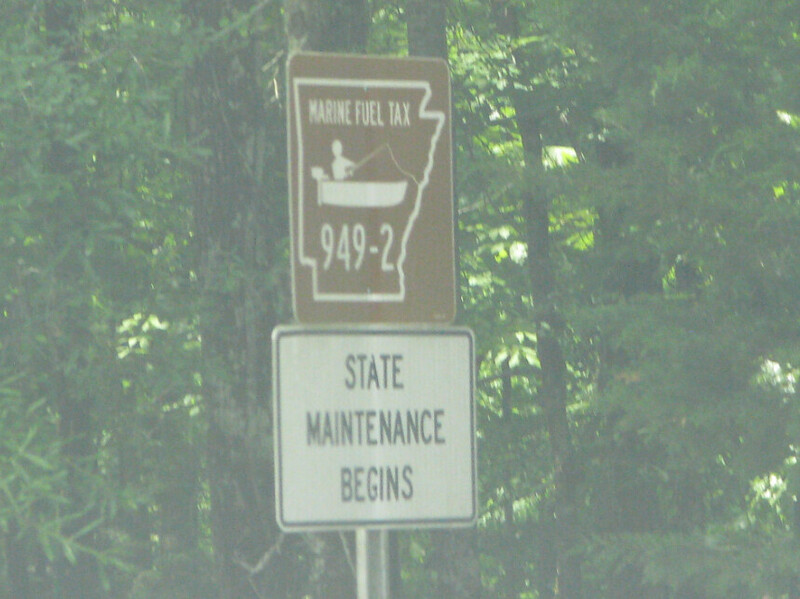 This was taken in Ouachita National Forest just south of Lake Ouachita, so I'm pretty sure this is forest/park signage. 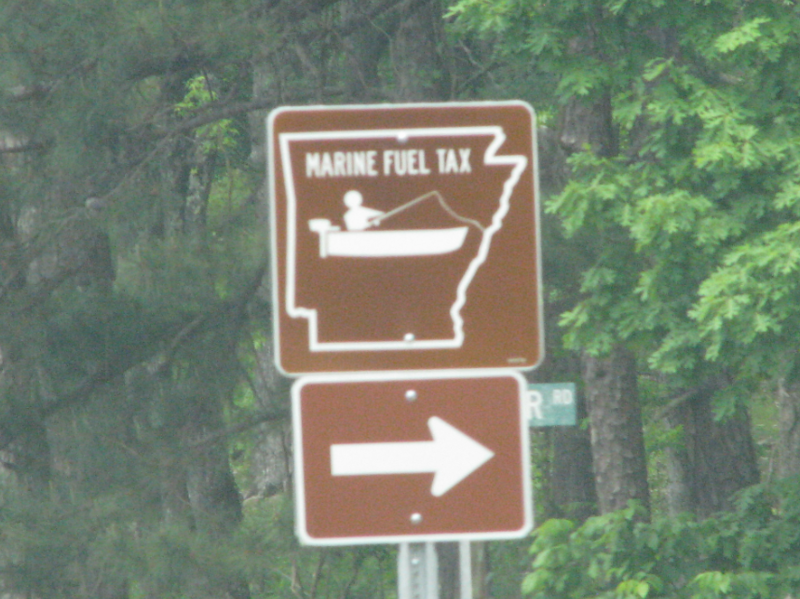 Ah, I was under the assumption that these Arkansas Fuel Tax highways were signed by the state, not the parks. The route markers and arrow are AHTD standard. I would guess they didn't put "949-4" on this sign because they wanted to standardize the design so they wouldn't have to produce different signs for each section. Were 949-1, 949-2 and 949-3 signed? If so, were the signs new looking? What about 926? 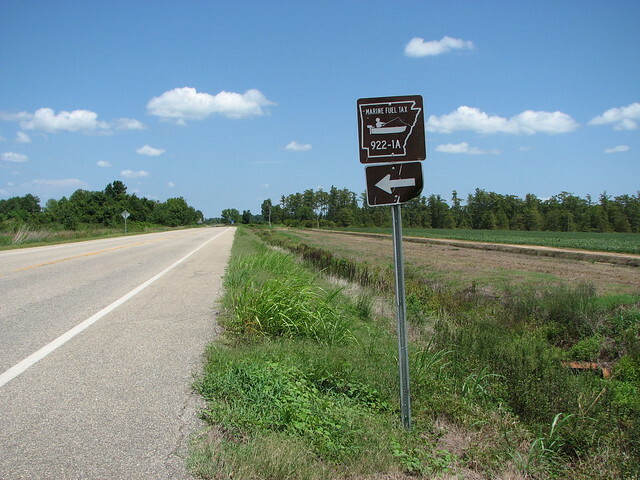 949-3 is not signed in advance, but it is on the actual highway. 949-2 is signed. And I don't know about 949-1. The blank ones look new, but the signed ones look older. 926 is signed as well. Thanks for the pictures. I'm actually surprised that 926 is still signed. Last time I was there, the signs were faded and it looked like it was going to be de-signed. Looks like typical Corps of Engineers signage that you'll see around most Corps lakes in Kentucky. It'd be kind of a shame if they stop putting the route numbers on the markers, IMO. I have never seen them with route numbers until this thread. The numbers look weird to me. 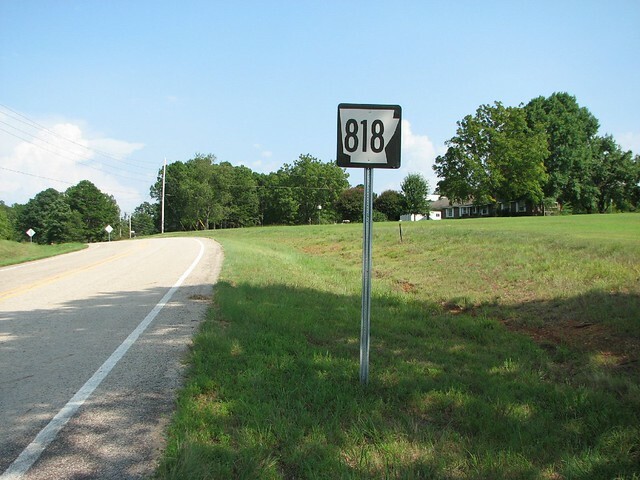 926 might be the last one in Arkansas that does not have a number suffix. I could be wrong though. I agree. I would say that the numbers make it easier to find where the right park/destination is IMO.